I'm not going to say either race was a barn-burner. 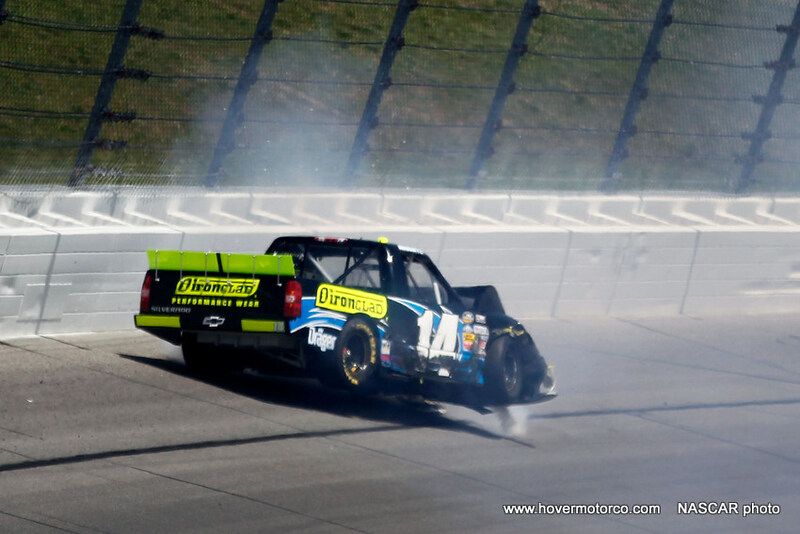 The truck race was mainly memorable because they tore up a bunch of trucks. 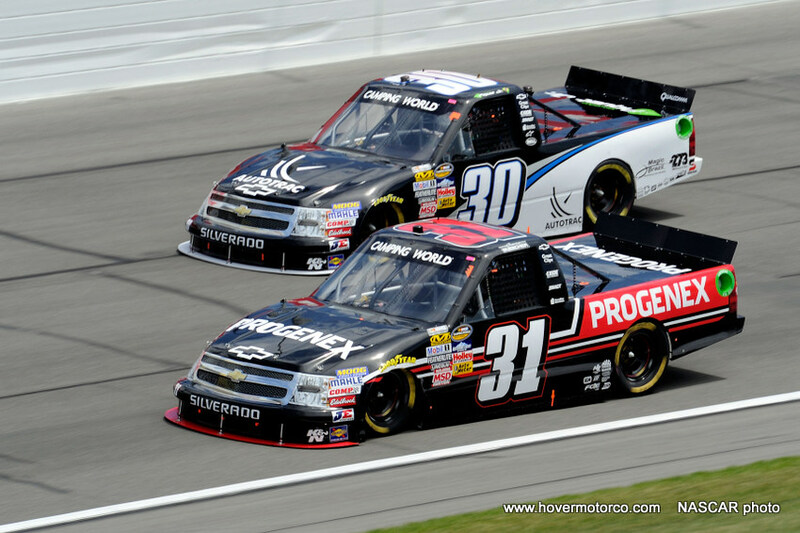 James Buescher ended up winning it with more than a five second lead. This was the 22-year-old's second ever major NASCAR win, as earlier this year he won the big Nationwide Series race at Daytona. Still, I was OK with how it ended, because I always feel better when a Chevy wins. This one was even painted a little like a '56 Chevy. I didn't feel as good after the Sprint Cup race on Sunday. 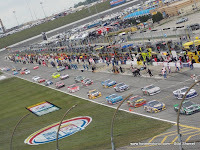 After watching Martin Truex, Jr. lead most of the day in his Toyota Camry, Denny Hamlin eventually took the checkered flag in another Toyota. Hamlin's car seemed to perk up later in the day as the sun came out, while Truex, not so much. As a side note, Jimmie Johnson was driving one of the ugliest cars I've ever seen him in. It was green because of Earth Day, but the green they chose did not look pretty with those black numbers. They said on the TV broadcast that it was actually painted a color of green that Chevrolet offered in 1968. I guess that should have made me like it better, but it really didn't seem to help. He did finish third, though. The race was obviously sponsored by STP, and they had a '72 STP Dodge on display at the track from Richard Petty's heyday. The Petty Blue and dayglow orange Charger was very photogenic, so I took several pictures of it. Aric Almirola drives the number 43 Ford Fusion for Richard Petty Motorsports in today's races, and STP picked up the sponsorship on that car for the Kansas race as well. That car was absolutely, by far, the most striking thing on the track. If you weren't drawn to that car, you had to be blind. 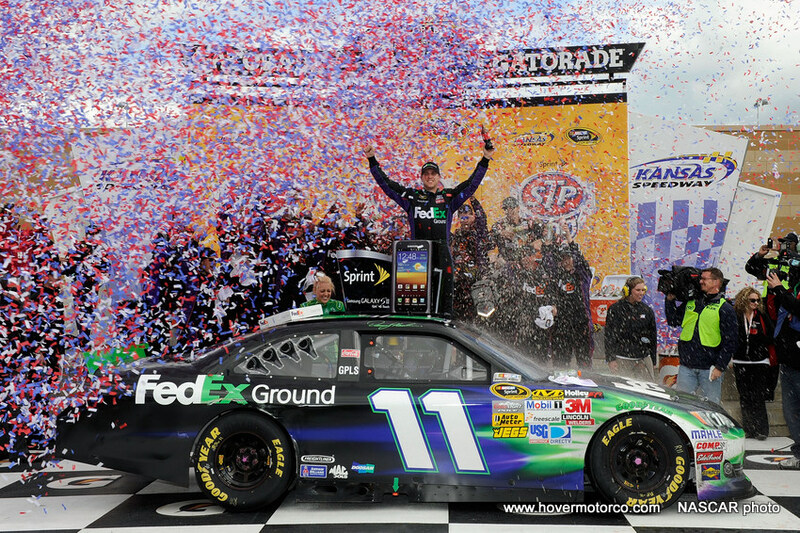 Anyway, NASCAR made an interesting point on their website that Hamlin's win in his car number 11 tied the record for most wins by any car number at 199. Richard Petty drove the number 43 to 192 of his 200 wins, so he's still The King. But the 11 saw victory lane with drivers like Cale Yarborough and Darrell Waltrip. Anyway, I thought that was interesting during an STP-sponsored race. 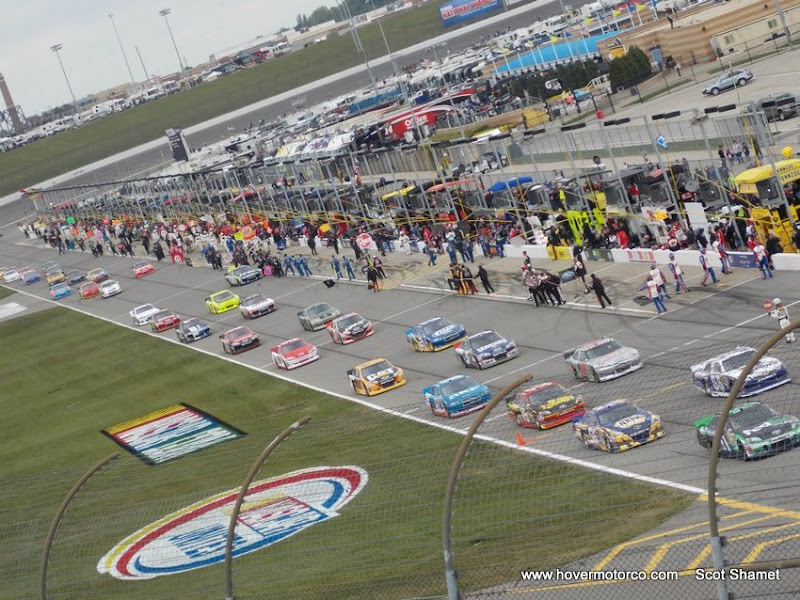 If you have never been to Kansas Speedway, you may be in for a surprise. I went out to the Friday practice sessions with my boss. We went through the manufacturers displays and souvenir trailers, and poked around down in the pits. Now he had never really been up-close to a major race like this before, and I could tell he was impressed. "This is like the Super Bowl," he would say. "I didn't know this was such a huge production. You don't get this on TV." Eventually, he had to leave, and I sat in the grandstands and just watched practice by myself for about two more hours. I know, it sounds kind of pathetic, but I'll tell you what, the weather was beautiful, and I really enjoyed myself. Those new flip-down seats out there are really nice, and there's something kind of cathartic about listening to NASCAR engines under sunny skies when there is no crowd around. I did not make it to the actual races, and in fact DVR'd it so I could watch it on TV without the commercials like most of America's race fan population. My friend Scot Shamet was there all weekend, though, and was generous enough to provide some of the race day pictures for this story. 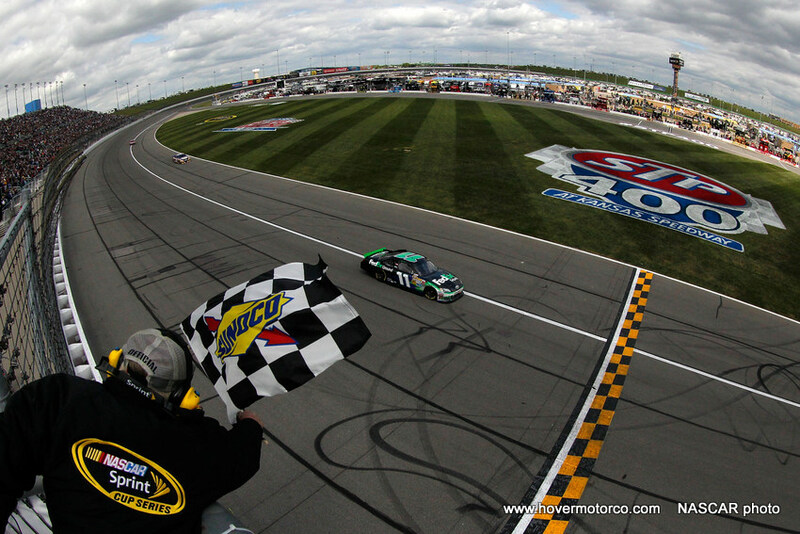 I also utilized NASCAR's media service for a few crystal-clear action and victory lane shots. I enjoy looking at these pictures, but I also think they're good for posterity. Just think of how cool this album is going to be 20-30 years from now. I truly wish I had pictures like this from these types of events back when my dad and I started going to them. Anyway, get a good feel for all the weekend's festivities by checking out the slideshow below.